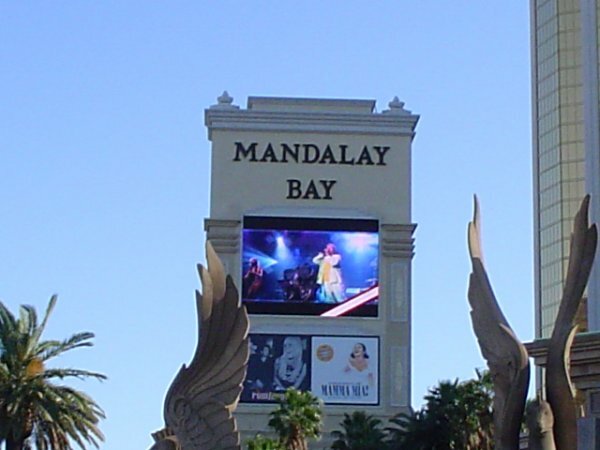 My wife and I drove from Montana to see the show in Las Vegas. Even after driving all the way down to go to a wedding only two weeks before. We enjoyed meeting friends from Minnesota who had come in from the shows in CA and went to the concert with them. I have nothing to add to the reviews other than saying I felt the show started off as one way to me and ended another. I felt it was a bit flat at the beginning and ended up on an exceptionally good vibe and in it's finality was one of the best Yesshows I've seen. 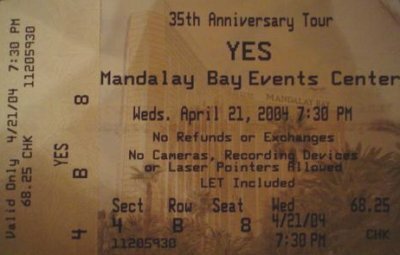 I'm glad we were there because one can never tell when a Yes tour might be the last . . .
On a side note, I took the actual picture of the poster (flyer) Paul Rogers sent in. Great show, great people. Yes and Yesfans are the best. This would be the first time in my life that I attend 2 shows in the same tour. Obviously no show is as impressing as the first one. However I still got very impressed with this second show. I thought they couldn't top the previous one, but they did. and the crowd was also better than Anaheim. 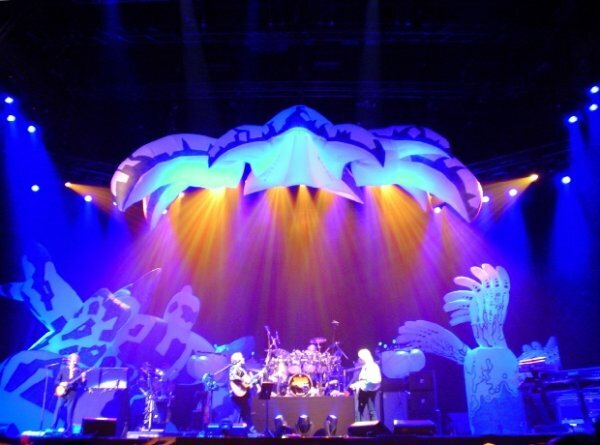 As a die-hard Yes fan, I was willing to accept I might be delusional in separating the cosmic British rockers from other '70s acts that have become the new nostalgia staples on the casino circuit. 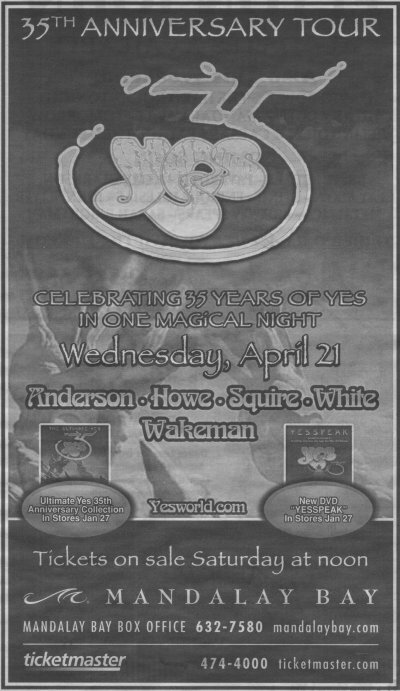 While the likes of REO Speedwagon and Styx recycle their hits to fill seats in repeated casino bookings, the past few Yes visits have shown the group hustling to sustain, sometimes a bit desperately, some type of forward motion. 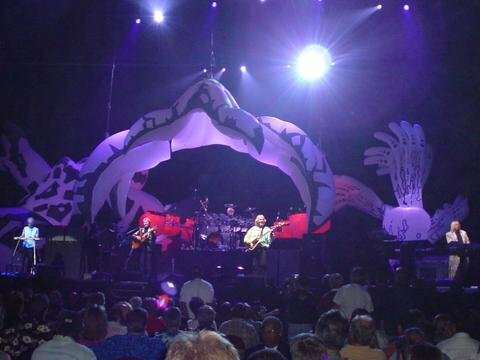 In 1999, they filmed a House of Blues show for a concert video tied to their new album "The Ladder." 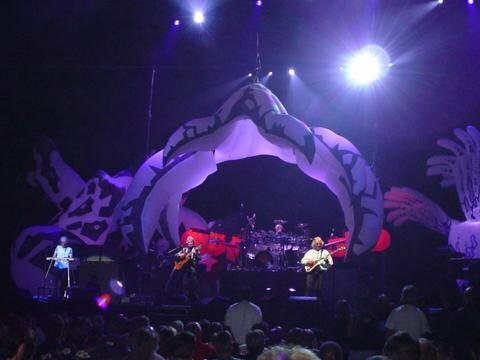 In 2001, they played Sunset Station with an orchestra to advance another new release, "Magnification." 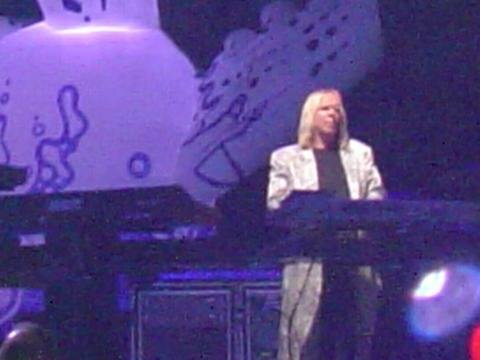 So you'd think Wednesday's arena concert at Mandalay Bay, billed as a 35th anniversary tour, would be a forgivable excuse for these visibly aging prog-rockers to coast with their most enduring lineup: singer Jon Anderson, guitarist Steve Howe, bassist Chris Squire, keyboardist Rick Wakeman and drummer Alan White. That longevity, plus the contagious affection for performing they've maintained even in lean times, could have been declared good enough. 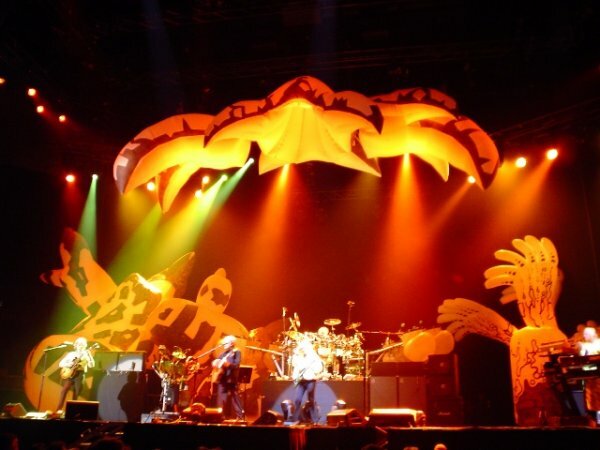 But it wasn't good enough for Yes, or the independent spirit that has always showed progressive rock was about more than long, twisting songs or virtuoso musicianship we almost take for granted. Even without something new to play, Yes found something new to play. 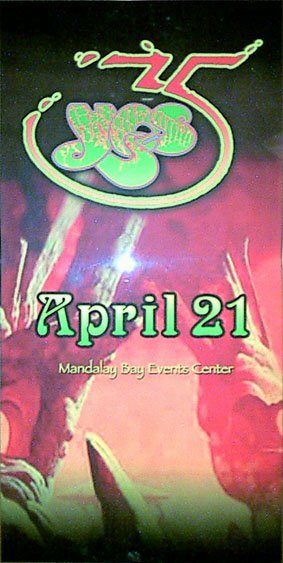 They dug up a couple of pieces -- one long, one short: "Mind Drive" and "Foot Prints" respectively -- that the current lineup recorded in 1997, but never got a chance to play live. They took this 35-year benchmark seriously, too, resurrecting "Sweet Dreams" from 1970, before they really became Yes as we know them, and "Every Little Thing," the Beatles cover from their first 1969 album. 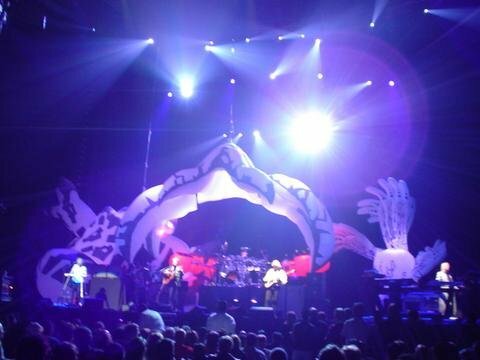 Saving the latter for the encore was arguably anticlimactic, as the usual crowd pleasers, "I've Seen All Good People" and "Roundabout," already had been doled out. 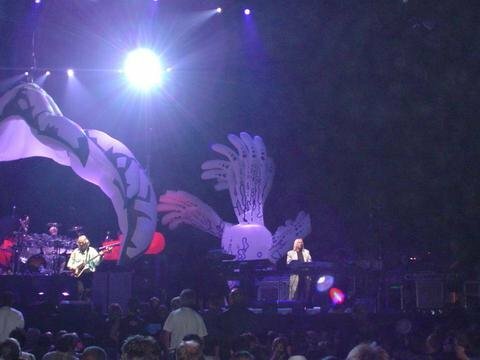 Sure, they could have used their biggest hit, "Owner of a Lonely Heart" for that encore instead of ignoring it. And there's an argument for doing such things that might help fill a few more seats. But a degree of stubbornness and independence always helps separate the originals from the hacks. 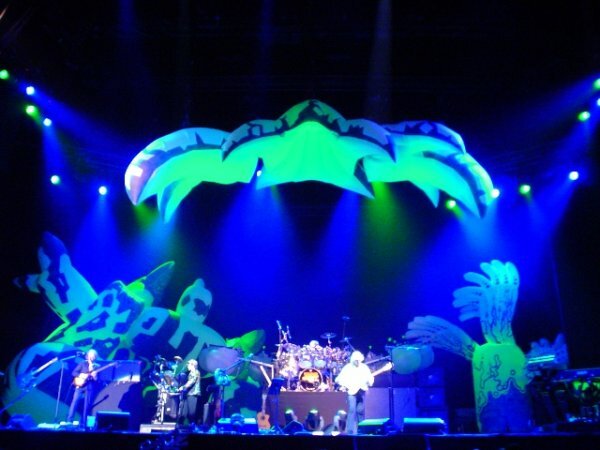 For Yes, that includes closing with a 20-minute-plus album side from "Tales From Topographic Oceans," an album once reviled (even by Wakeman) for its excess that now commands respect, albeit limited. 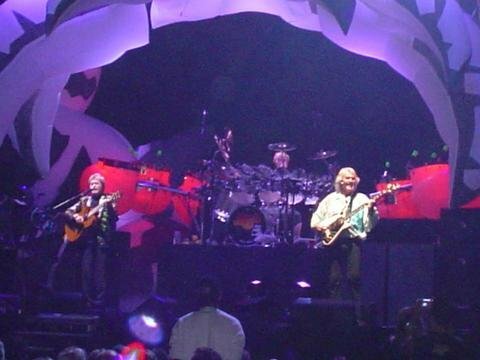 And while the crowd wasn't much more than could have fit into the House of Blues, it was great seeing Yes on an arena stage again. 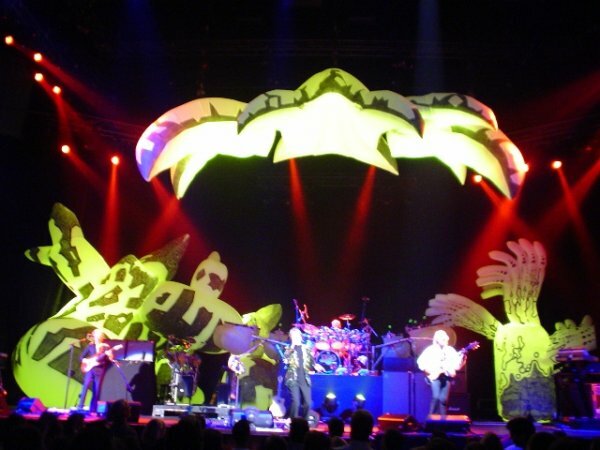 It was the first tour in ages to have a set decorated by trippy inflatables designed by Roger Dean, the artist of their classic album covers. 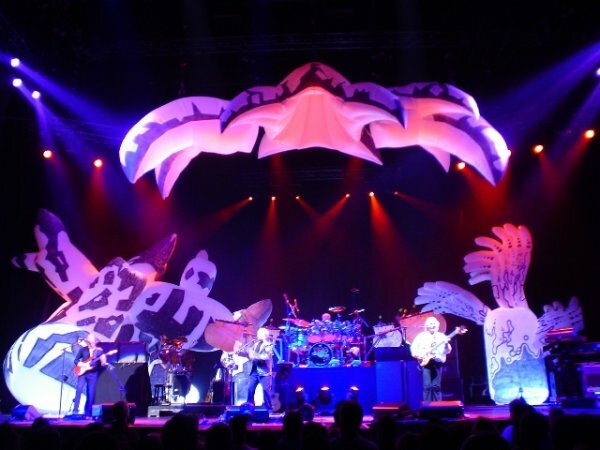 It was even fun to laugh at some Spinal Tap-like moments, such as White's drum extensions whirling like an amusement-park ride, or an inflated tentacle bumping Squire in the face ("I think it likes you," Anderson quipped). It's all about sticking to your guns whether it's fashionable or not. That's punk rock, er, prog rock for you. Hey Paul,enjoyed reading your story and review.I think your right,by the time the boys hit their adopted hometown of Philly,they should be a well-oiled machine.I can't wait. one door slightly cracked. So what do we do? Walk in of course! even notices us, probably thinking we're with the event staff or something... we're loving this big time! version of Sweet Dreams, sounds great. We wander some more... Wander backstage and see Rick. We say hello and shake his hand. Must have been a hot date for Mako...Close to the Edge was not played. Set list was the same as Anaheim. Excellent show, as always. 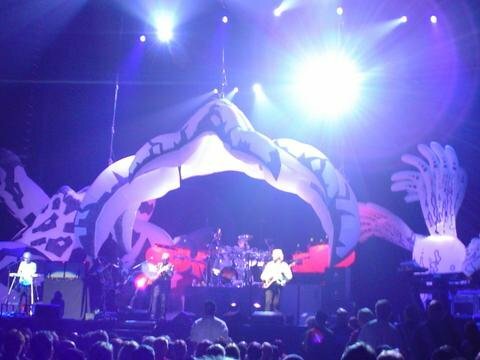 They opened with Close to the Edge, and carried on through many of their old standards and some of their newer material, but with some interesting twists. I don't have a set list - having a date for the show (yay! :) made being a set list wonk impossible. If anyone has one, please post it here. 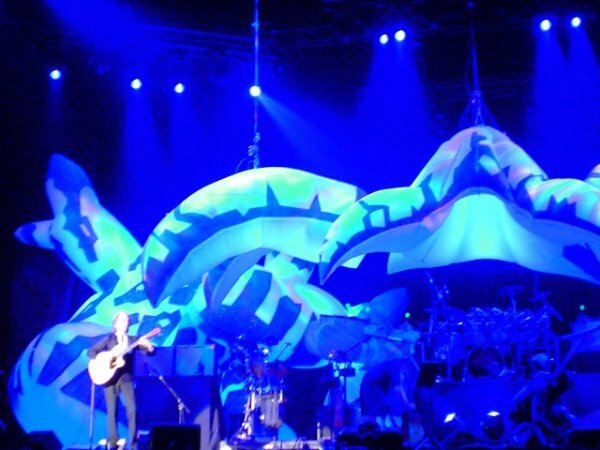 The 2nd half of the show was particularly cool, with the band moving to the front of the stage with a pseudo acoustic setup - much more modest instrumentation ( Alan behind a small drum kit, Rick with an electric piano (Clavichord or similar?) Chris with an acoustic body bass guitar, Steve with a couple of acoustic body guitars, including one he plays as a slide guitar (very cool!) and Jon with a 6 string. 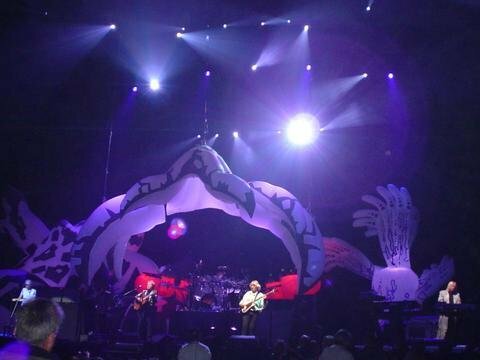 The stage set with the Roger Dean inspired "bird" props proved to be a bit of a pain at the beginning of the "acoustic" set - the roadies lowered the "bird" too much, causing Steve to have to move to the left to keep from having it bump him in the head and Chris to have fun poking at it. Not a note was missed however, the guys took it all in stride. Eventually the roadies got the proper pulled up and out of the way and all was back on track once again. I greatly enjoyed the "acoustic" re-arraignments, particularly the boogie woogie-ized version of Starship Troopers(! 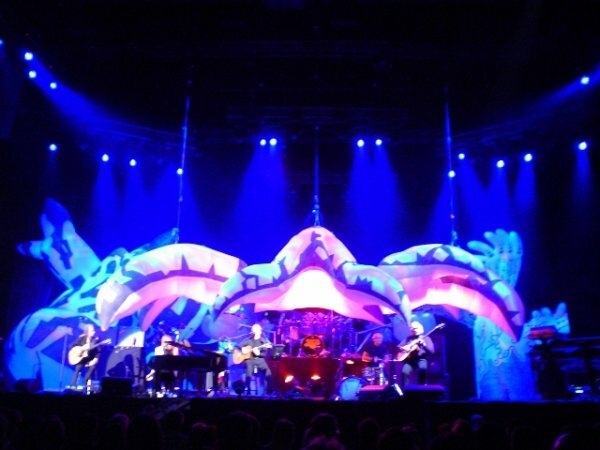 ), that was great good fun for the band to play and the audience had a fun romp with it too. Jon ended up parading through the floor seating area later in the 2nd set while singing with a wireless mic, much to the delight of the crowd. He was having a blast too judging by the smile on his face as he was doing high fives with the fans and generally having a great time zooming around through the crowd. The sound mix was good, though I would have preferred more of Chris' bass at times - that might have been due to my off to stage left and up higher seating though. I really had a good "line" to Steve's voice PA, which was very cool, as his vocals were "above" the mix a bit - it's nice to hear the individual voice parts in the harmony parts. The massive 3 part drum piece with Alan, Chris and John hammering the hides off of everything all at once was a *Blast* to watch. The mechanized/synchronized drums hanging off Alan's big kit are just cool as hell too. I wish he was able to use them more during the show, but alas, this one 5 minute piece was about the extent of them. 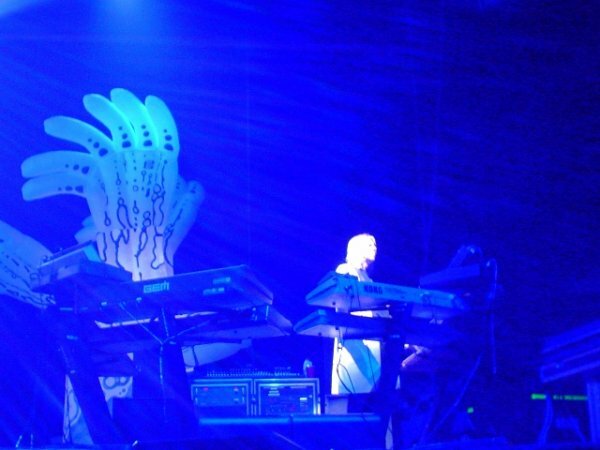 The light show was very modest, a few varilights and some projection lights and that's about it. The fog machines weren't cooperating very much, but I didn't miss them really. All in all a darn fine show by the lads with some novel arraignments of old standards and a nice sprinkling fresh tunes made for an excellent night. Don't miss this tour if you can help it, the "acoustic" set alone is well worth the price. the best band of the world !!!!!!!!!!!!!!!!! Looking forward to seeing all good people from USA.